The 2014 Drivers’ and Constructors’ champions Mercedes AMG Petronas have revealed the first official picture of their 2015 title defender after a shakedown test at Silverstone. The team were on track with both the reigning world champion Lewis Hamilton and his runner-up team-mate Nico Rosberg. he design trend of the 2015 cars so far has been maintained with the 2015 Mercedes, as the car is largely an evolution from last year apart from the look of the front nose. 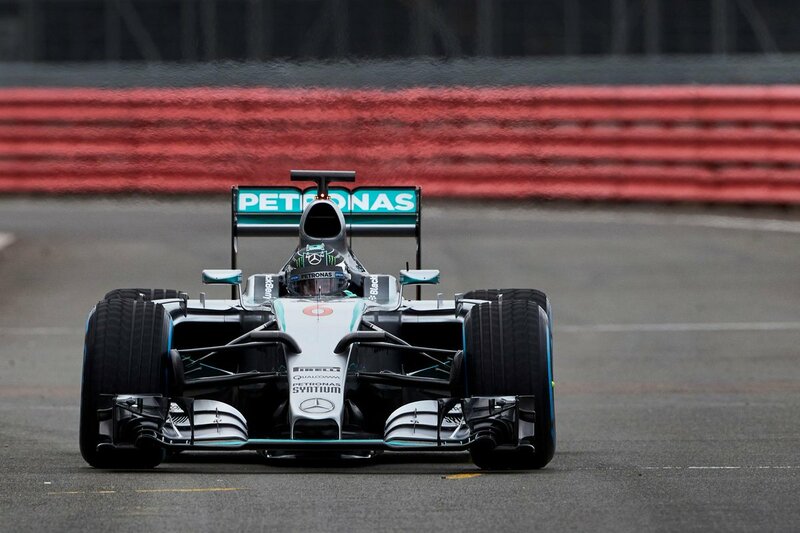 The W06 features a more pointed version of what we saw last year. Along with this, the rear of the car appears to be packaged much tighter, a feature also seen on the McLaren MP4-30 launched today. Hamilton and Rosberg completed a combined total of 18 laps of the British Grand Prix circuit in a test that is classified as a promotional event as per FIA regulations. The event was bought to an early end when a blizzard set in during the afternoon. The W06 will be officially unveiled in the pit-lane in Jerez on Sunday (1st February), before Nico Rosberg takes to the track for the first day of testing. He will return to the cockpit on Tuesday, with champion Hamilton driving on Monday and Wednesday.